Here I am 'banging on about footy again' (as Rhyll says) but I have to share because I worked hard again while watching. So Dragons v Storm had me all hot under the collar until I realised it was the week before the rep round, and the Aussie players would be missing. Man, was I bummed. And then, Thursday night TV game, I realise the Aussie players are in that game. Holy hell, that meant they might be there on Sunday. And yes! My assumption was totally false. 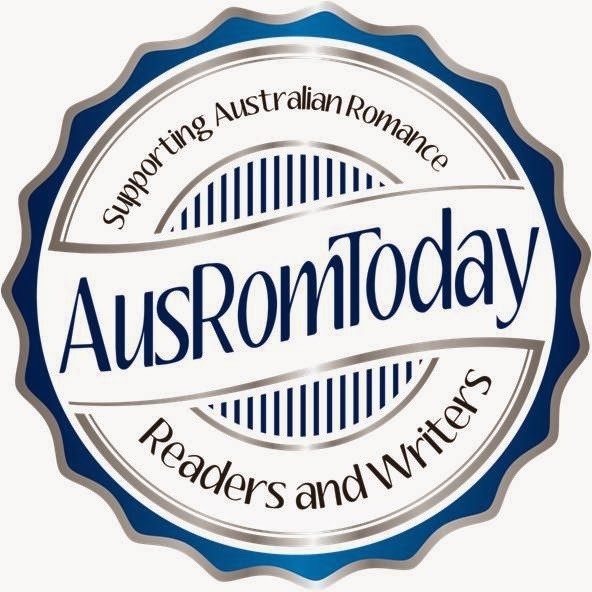 Aussie players were playing their round. Which meant Storm at full strength, which meant quite a lot of perving for me to do. As Mr E will tell you, I dragged myself off my sick bed to go. On Friday I was sure I'd die with fevers. But fortunately, by Sunday fevers had gone and the sun was shining, there was no breeze and WIN Stadium had a seat with my name on it. Oh boy! Nothing like perving with your hubby and mother-in-law right there teasing you! 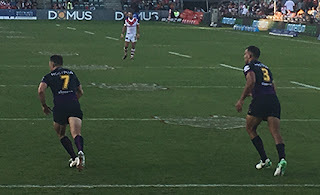 Add that every single person around our seats hated the Storm, hated Cooper Cronk, and everyone could see who my camera phone was zoomed in on. Yep! Nothing like being the odd woman out :) But I persisted! 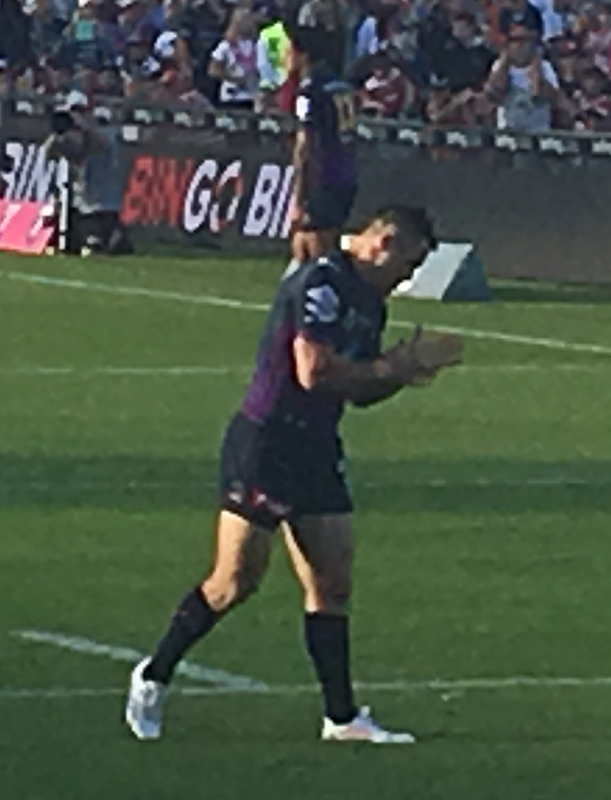 When Cronk got sinbinned for 10 minutes for a professional foul, you should have heard the stadium - I've never heard so many boos and jeers as for the long time it took him to walk off that field. He laughed initially, but I wondered how he felt by the time he'd got into the dressing rooms. I think only Cameron Smith would have had more animosity. 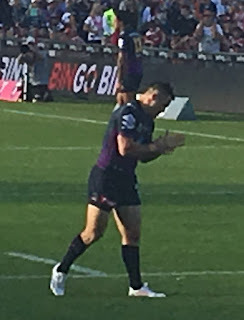 While I've been crushing on Cronk, it's been almost impossible not to get caught up with the rest of the team, but especially Cameron Smith and Billy Slater. 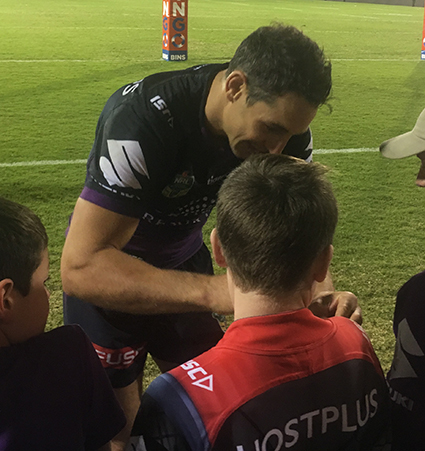 Billy Slater is really social media savvy, and his wife's an incredible artist who is also good on the social media. So I've been following the Billy rehab after his two shoulder surgeries. I've been watching his return to teh game with amazement, each week he's improving when the first week he was good anyway. The man is a freak. But on Sunday, after the game, he stood and signed autographs for the kids before going off the field. I'd made a little detour on the way out, so I was pretending I owned one of those kids and checking him out. Fabulous with the kids, he didn't miss signing anyone, or duck out of any photos. He got down to their level, smiled, posed, signed. Professional, but this was a man who liked kids, and probably remembered being these kids years back. He was fantastic. He was little. Freaking hell, is he little. I'd seen him on the field and he's not the tallest guy, but he doesn't have to be so I didn't think much of it. But it's not just height. He's fine-boned, all muscle and sinew, sort of like a jockey's body. Photos don't seem to pick it up. And I was standing there, staring at the poor man, trying to get his physique into my head because I want him in my MMF. He's the type of body I want for one of my guys but I didn't do a good enough describing him. And I don;t have words. My brain's still trying to process the big heavily muscled guys I'm used to seeing on the footy field, with this guy who should be riding horses. A guy who's so short, yet he flies up for balls higher than everyone else on the ground. A guy so little, yet he's made the Australian Team. And I start wondering how he'd look next to Jonathon Thurston. Would JT, who everyone says is tiny, look so little next to Billy? And then I hear Mr E and his Mum calling me. And since this version of me doesn't exist for the MIL, I can't really explain why I'm standing there staring into space trying to find the words to describe a man's body. So I leave. And I'm still perplexed...but not by the man who usually has all my attention. Aww, love it. Great post! I love the line about pretending one of the kids was yours so you could get close!